* Our 2 1/2" h all White bridal garter has delicate tulle generously embroidered with climbing vines. * It is finished with a scalloped skirt, satin ribbons & a brushed silver flower with baby pearls & crystal. * Our boxed garter comes in 3 other color ways. * This finely crafted White Wedding Garter is inspired by Irish lace & features delicate tulle finely embroidered into a scalloped skirt. * The embroidery has climbing vines & leaves. * Our wholesale garter has a brushed silver enamel flower adorned with a crystal center and baby pearls. * The garter is finished with a white satin ribbon bow. 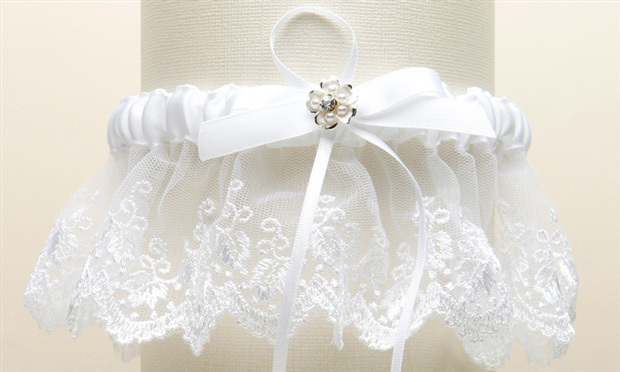 * Our garter is also available in White/Blue, All Ivory or Ivory/Blue.